EWG scientists reviewed derma e Stretch Mark Creme (2014 formulation) for safety according to the methodology outlined in our Skin Deep Cosmetics Database. We assess the ingredients listed on the labels of personal care products based on data in toxicity and regulatory databases, government and health agency assessments and the open scientific literature. 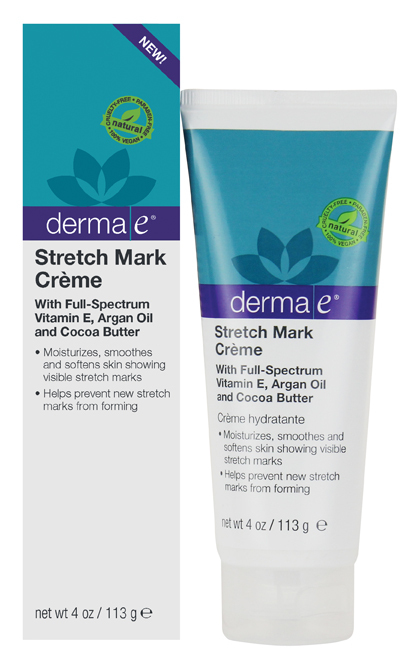 EWG's rating for derma e Stretch Mark Creme (2014 formulation) is 2. Purified Water (Aqua), Propanediol (ZemeaÂ®), Caprylic/Capric Triglyceride, Theobroma Cacao (Cocoa) Seed Butter, Cetyl Alcohol, Glycerin, Glyceryl Stearate Citrate, Glyceryl Stearate, Cetearyl Olivate, Sorbitan Olivate, Sodium Hyaluronate (Hyaluronic Acid, ActimoistÂ® Bio-1), Organic Camellia Sinensis (Green Tea) Leaf Extract* (1%), Organic Argania Spinosa (Argan) Oil* (1%), Tocopheryl Acetate (Vitamin E), Panthenol (Provitamin B5), Cocos Nucifera (Coconut) Oil, Prunus Amygdalus Dulcis (Sweet Almond) Oil, Elaeis Guineensis (Red Palm) Oil, Organic Butyrospermum Parkii (Shea) Fruit Butter* (.1%), Allantoin, Potassium Cetyl Phosphate, Xanthan Gum, Lavandula Angustifolia (Lavender) Essential Oil, Citrus Aurantium (Neroli) Essential Oil, Phenoxyethanol, Ethylhexylglycerin. *Certified Organic by Quality Assurance International or USDA. Use two to three times daily. Apply with a circular massage motion, concentrating on areas where stretch marks form (thighs, hips, abdomen, bust, lower back).